Andy Rubin's Essential Phone (PH-1) wasn't quite the hit that many had hoped it would be. Still, Essential could be applauded for the edge-to-edge display found on the phone (see image at the top of this article), and the quick updates that allowed users to install Android 9 Pie before most of the Android-using public. 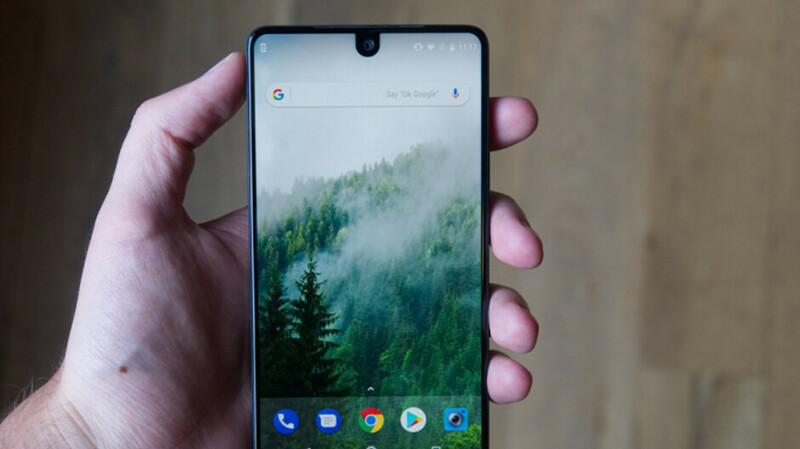 Toward the end of last year, the Essential Phone was discontinued and now Slash Gear has discovered evidence that the Essential Phone (PH-2) is being developed. Drawings viewed by SlashGear show that the Essential Phone sequel might feature a full edge-to-edge screen without requiring a notch. 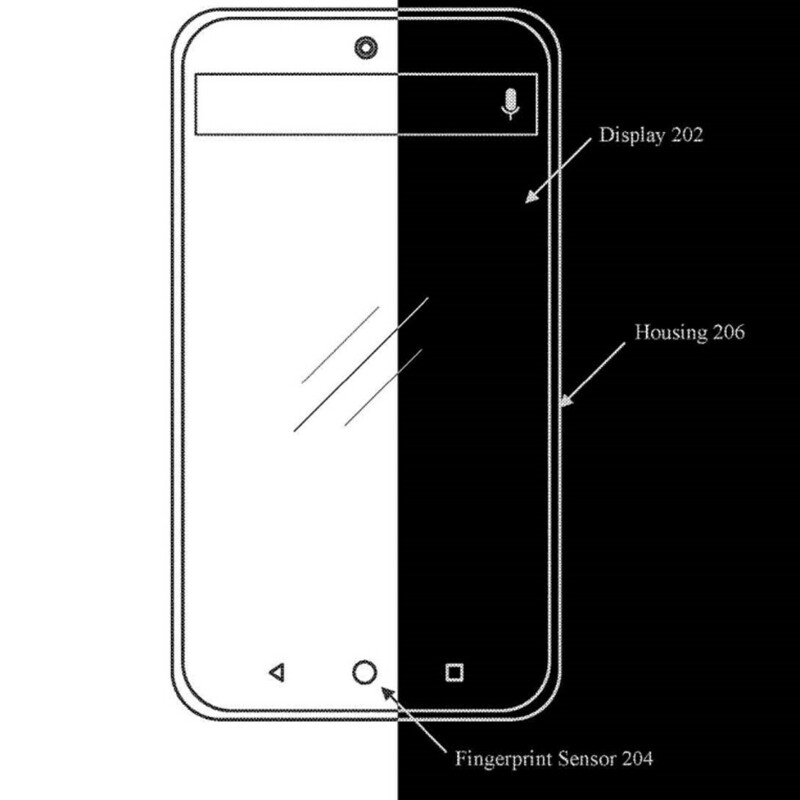 Instead, the images show that the PH-2 could include one camera and one sensor hidden behind a display that would become partially transparent at the user's request. Essential is reportedly looking at using this feature with either an LCD or OLED panel. Another drawing shows an in-display fingerprint scanner at the bottom center of the display. A punch-hole selfie camera is seen at the top of the screen. This image was taken from an Essential patent related to the in-display fingerprint scanner, which could be why the semi-transparent screen that we mentioned above was not included in the sketch. Earlier talk of a new Essential Phone centered on a completely new type of mobile device that would make appointments for you, answer email and texts for you, becoming a "virtual version of you." It isn't clear whether we will see these capabilities on the next Essential Phone; recently a carrier's support documents mentioned the PH-2 and that tends to make us believe that there will be a new handset coming out of Andy Rubin's company some time later this year. I do not mind a few millimeters of edge, as long as they do away with those damn notchs once and for all. If they are making an Essential Phone 2 (which remains to be seen, since early info pointed to them not doing so), I hope they take their time and get it right this time around, as opposed to releasing what could be seen as an unfinished product with the Essential Phone 1. I really wanted to purchase the first Essential Phone, but it had too many issues. Here’s to hoping they get it right this time (if it’s really happening). I’d hate for them to end up looking like the Pixels, with their issues after issues from one generation to the next. As a late buyer of the Essential Phone (after the prices had dropped significantly and after many of the issues were fixed), I think they had a great device on their hands. By the time I bought it, there was not much to complain about, and a lot to like. On the software side of things: stock Android experience, day 1 Android 9 updates, and no bloatware. On the hardware side of things: adequate but clear speakers, good vibration mechanism, clear earpiece, good screen, premium construction (titanium + ceramic), premium fit and finish, reasonable size, felt good in hand. Camera was solid overall (great in good lighting, mediocre in low light, sharp in monochrome mode). I for one really hope they succeed and continue to make devices. They seem to care about the details more than most companies. Everything was good except for their camera before updates kicked in. They were start ups back then so ess phone 2 could be a bigger improvement. J. Williams uploaded an essential phone with pixel cam app, you can try to see it if you're interested. $417 for the white 128gb model, still a good deal if you're not into latest. There were other issue before the updates kicked in, like not being able to connect to the T-Mobile network. That issue lasted for the better part of the year, iirc. It just took too long for my tastes for the issues to get fixed. It seemed like they were dragging their feet with the fixes. I don’t think they should have released the phone when they did, as unfinished as it was. I really hope they don’t make the same mistakes if there actually is an Essential Phone 2. I’d love to get one. If you could live with the ok camera the phone was a major win in terms of build quality and support it received. The camera definitely is in a lower class than my LG G7. But the Pixel Camera port helps a lot in quality shots. The one thing I love most is the 360 camera. It's a cool gimmick. No doubt essential phone was ahead of it's time. I hope the company made money with their small notch patents before, bounce back with awesome essential phone 2 and make ceramic/ titanium combination a 2019 trend. I liked the PH-1 (once the price dropped to a REASONABLE level) except for ONE tiny problem. (straight talk, tracfone at&t sim), the LTE signal level was just all over the place. Places I had NO ISSUE with signal on my Huawei Mate9 or my new OnePlus 6T, I had NO signal. Perhaps the METAL back cover was screwing it up, or they had a bad modem/antenna design. Other than that, it was a very good phone, quick with updates. I have an AT&T SIM in my Essential and I haven't seen any reception issues. I wonder if they fixed it, or if different handsets have different reception issues due to defects. I dunno. I got one for $225 from Amazon, I use it everyday as a secondary phone and I love it. I especially love the 360 camera for vacations. I got the 360 camera for $36 on Amazon too. The bang for the buck is serious on this one. Bought the wife an essential phone shortly before they went out of stock. Paid almost nothing for it on Amazon. It's been a good phone. But the camera isn't up to par. It takes some awesome black and white photos. But color photos are nowhere near as good as other phones which is ok for a $300 phone, but considering this started out as a $700 phone, essential had no excuse. They'll need to nail the camera quality with this sequel, and to earn a little goodwill, they should price it similarly to OnePlus. Or if they go the expensive route, include a bunch of stuff for the early adopters. VR goggles, cases/accessories/attachments/etc.